Situated on gently sloping terrain in Montjuïc Park, Jardí Botànic de Barcelona (Botanical Garden of Barcelona) offers visitors a different walk in each season of the year as they observe vegetation from the five regions in the world with a Mediterranean-type climate. The purpose of the Jardí Botànic is to conserve and disseminate collections of Mediterranean plants from around the world. Among its main objectives are: the conservation and documentation of the natural heritage of Catalonia; to promote botanical and naturalist culture; and to promote knowledge of and respect for nature. The Jardí Botànic has a close relationship with the Institut Botànic de Barcelona (IBB), a prestigious centre jointly managed by the Barcelona City Council and the Spanish National Research Council (CSIC). The facilities at the IBB, which specializes in botanical research, include a large, comprehensive library and one of the largest herbaria in Catalonia. The IBB is located in Montjuic Park, in the upper part of the Jardí Botànic. 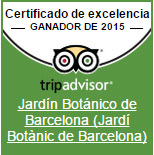 In 2015, the Jardí Botànic de Barcelona (Botanical Garden of Barcelona) was awarded a certificate in excellence for hospitality by TripAdvisor, based on opinions posted by visitors and users of the site.